Top Democrats reacted to the news on Friday that former National-Security Adviser Michael Flynn had pled guilty to lying to the FBI by warning that President Trump or his allies may try to curtail ongoing investigations into Russia’s attempt to influence the 2016 presidential election, and insisting that those investigations continue without interference. Flynn, a close Trump ally who campaigned with the president and briefly followed him into the administration, made false statements to investigators about his contacts with the Russian ambassador about sanctions implemented by the previous administration. Those sanctions were put in place to punish Russia for what U.S. intelligence agencies said was an effort to interfere in the 2016 election on Trump’s behalf. Flynn also said on Friday that he is cooperating with the special counsel investigation led by Robert Mueller. 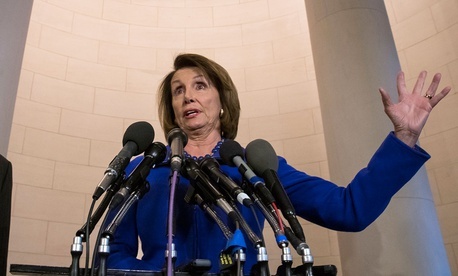 Democratic House Minority Leader Nancy Pelosi called on Congress to shield the special counsel probe from White House interference and reiterated her call for an outside independent investigation. Pelosi has praised Mueller, a former FBI director, as “a respected public servant,” in the past but has also expressed concern that the White House could attempt to interfere with his investigation, which is operating under the supervision of the Department of Justice. “The U.S. Congress has a duty to uphold justice, and to take measures to ensure that Special Counsel Mueller’s investigation proceed without interference from the White House,” Pelosi said in a statement on Friday, calling for “an outside, fully independent investigation.” Pelosi has called for an outside investigation for months that could operate in the mold of the 9/11 commission, a bipartisan commission set up by Congress that produced a wide-ranging report on the September 11, 2001, terrorist attack on the World Trade Center. Adam Schiff, the top Democrat on the House Intelligence Committee, warned in a statement that “the plea secured by Mueller may prompt the White House and its allies to seek to curtail congressional investigations, as President Trump has attempted to do already, or end the special counsel’s work prematurely. Congress must make it clear that this would not be acceptable.” The House and Senate Intelligence Committees are both probing Russian election interference and potential Trump-Russia ties. Dianne Feinstein, the top Democrat on the Senate Judiciary Committee, similarly said that “investigations must be allowed to continue without interference,” though she did not call for an independent outside investigation. High-ranking Democrats focused attention on Trump on Friday. Flynn’s guilty plea marks a new stage in the special counsel investigation.